Mother’s Day is approaching, so naturally I’m thinking of gifts I can get for my mom. But for me, it can be hard to get a gift that even comes close to showing my appreciation for how much my mom has done throughout my life. If we’re lucky, we grew up with moms who created warm and welcoming homes for us kids. Filled it with love and laughter. Kindness and strength. My mom was a pillar of strength. 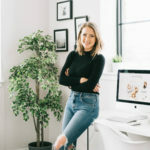 As a single mom, she worked full-time so that my sister and I could have a great life; so we could do dance class on Monday, acting on Tuesday and Thursday, basketball in the winter, and softball in the spring. So that we could get those sparkly jeans from Limited Too and as much gimp as we could braid. And after a full day of work, she’d come home and cook a homemade meal for us. Followed, almost every night, by cookies or brownies. My mom created a warm and welcoming home in many ways, but one of those was by having brownies and cookies on repeat. Something was always coming out of our oven, and 9 times out of 10 it was some sort of baked good. It was her way of quelling her insatiable hunger for dessert, and for my sister and me, it meant love, care, and sweetness. So for Mother’s Day this year, one of my gifts will be a batch of these caramel brownies, topped with Ghirardelli Chocolate SQUARES. These cocoa brownies are fudgy and rich, just like how my mom used to make them, but I’m adding my special touch by topping with Ghirardelli Milk Chocolate Caramel & Dark Chocolate Sea Salt Caramel filled SQUARES. 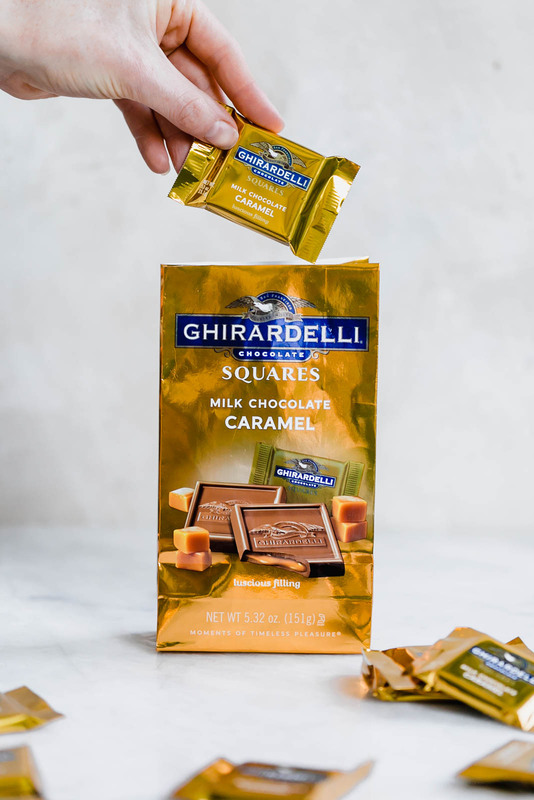 Ghirardelli SQUARES are the perfect way to elevate these brownies and make them an extra special gift. 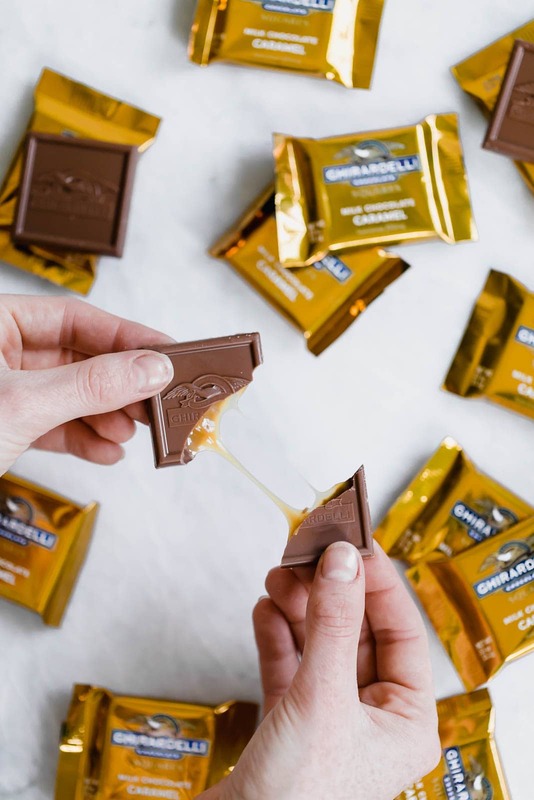 With over 160 years of chocolate-making experience, Ghirardelli has established its position as America’s premium chocolate company. They control all steps in the chocolate-making process to ensure every SQUARE is the highest quality, which is especially important when creating an edible gift such as these cocoa brownies. Break up any clumps of brown sugar — Brown sugar has a tendency to clump up as it sits in your pantry. If you notice any sugar clumps in your brownie batter, squish them with your fingers or the back of a fork. You don’t want to chomp down on a piece of pure sugar when enjoying these caramel brownies! Slightly under bake the brownies — For the fudgiest possible brownies, you should slightly under bake these babies. You’ll know when these caramel brownies are ready to be taken out when a knife inserted into the middle of the pan comes out mostly clean. 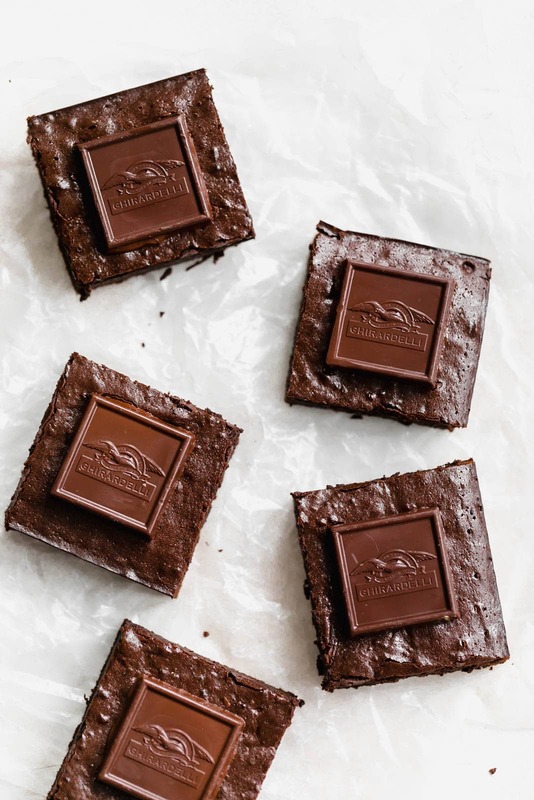 Wait a few minutes before adding the SQUARES — The trick to getting the Ghirardelli SQUARES to stick to the brownies without melting too much is to let the brownies cool for 15 minutes first. This way, the brownies are still warm enough to melt the chocolate slightly without being so hot that they melt the chocolate completely. I hope these caramel brownies will remind her of how much she did for my sister and me, and how much her baking meant to us. And mom, since I know you’re reading this, sorry in advance your Mother’s Day gift is no longer a surprise. I love you! Preheat oven to 350°F. In a microwave-safe bowl, melt the butter. Remove from microwave, stir in sugar, and melt both for 30 seconds. Stir again and melt for 60 seconds more. Remove mixture from microwave and allow to cool for 10 minutes. Once cooled, place into large mixing bowl and add in eggs, vanilla extract, and salt. Last, fold in cocoa powder and flour. Pour batter into a parchment lined 8″x8″ pan. Bake for 25-30 minutes, or until a knife inserted in the center of the brownies comes out clean. 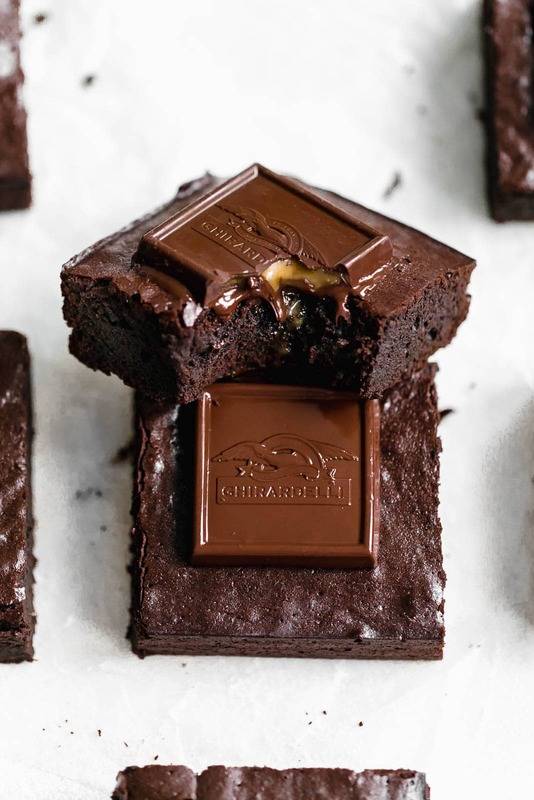 Allow to cool for 15 minutes before lightly pressing 9 Ghirardelli SQUARES into the tops of the brownies. The squares will magically melt just slightly so that they stick to the tops of the brownies 🙂 Cut into 9 brownies and serve! 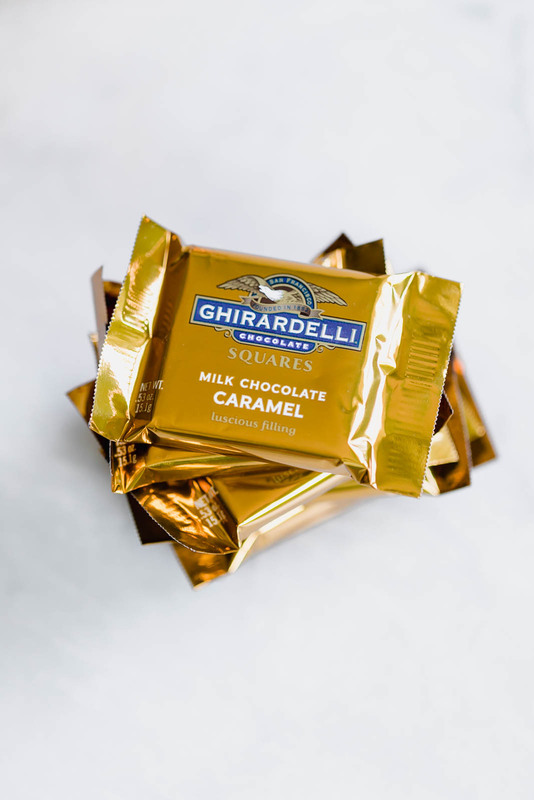 This post is sponsored by Ghirardelli. All text and opinions are 100% my own. Thank you for continuing to support the brands who help make Broma possible! 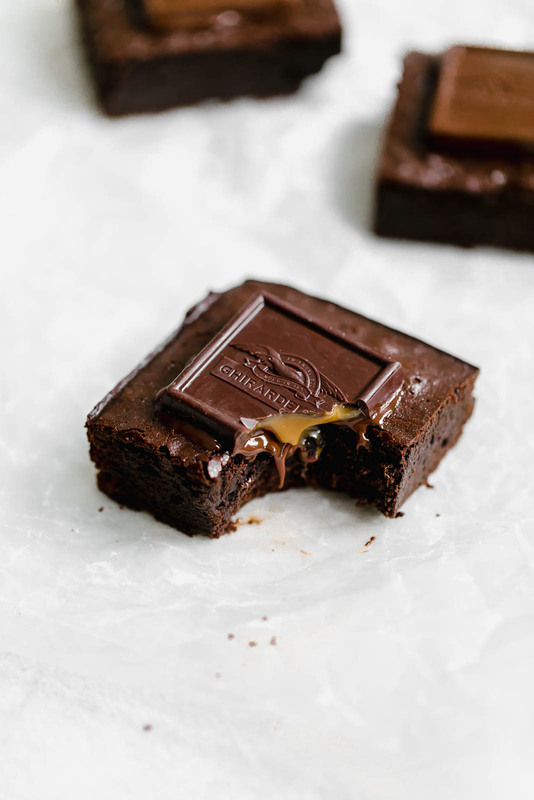 Yum brownies and a milk chocolate caramel piece?! Heaven! And per usual gorgeous shots! 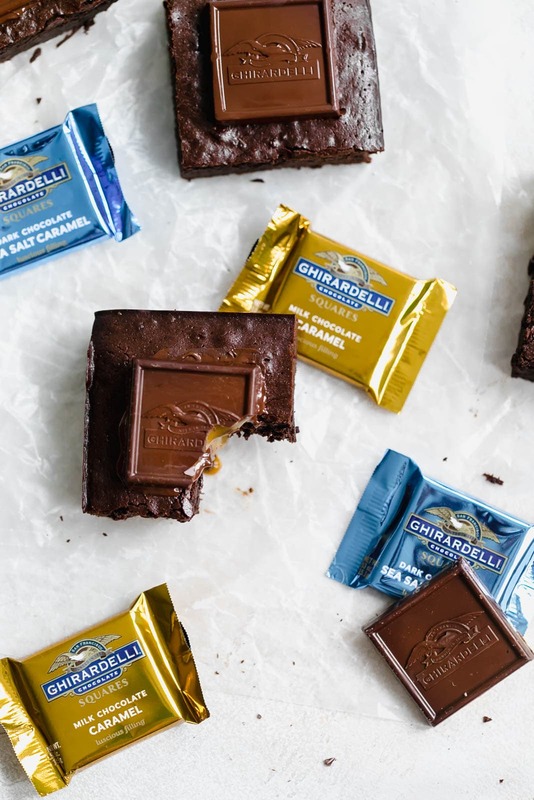 How do you get the Ghirardelli Squares to the brownies? 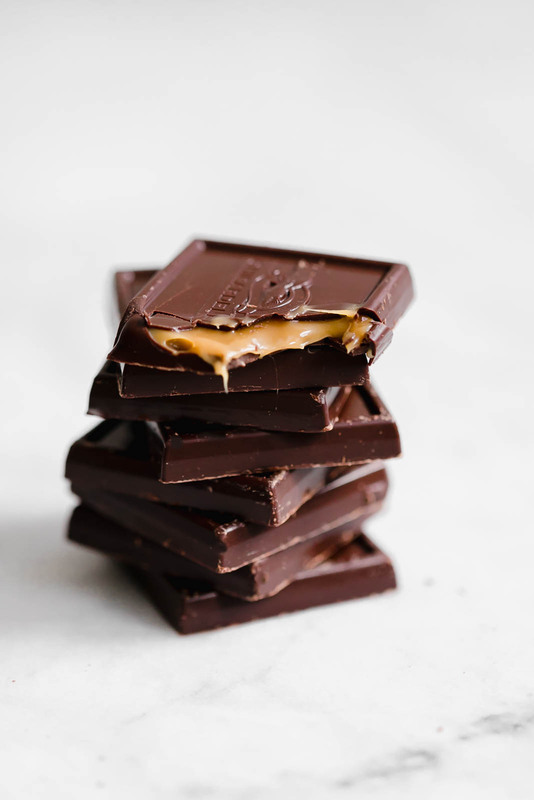 Whenever I unwrap a chocolate I eat it! 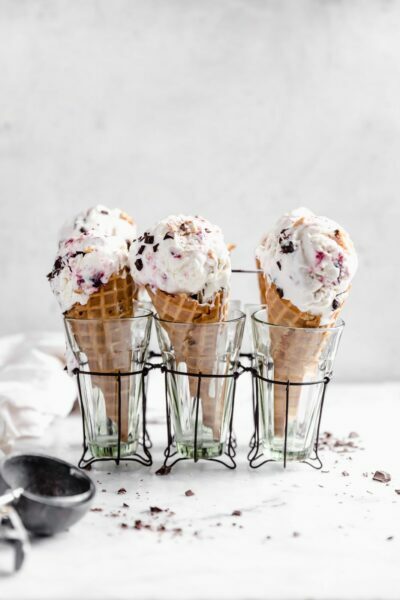 Thanks for this wonderful and thoughtful recipe … and of course for your amazing pictures, I just love your work! oh my goodness, yes please! Now to somehow nonchalantly tell my hubby to make these for me! Surprise or not she will absolutely love these I’m sure! These are my weakness! I need a batch all to myself! 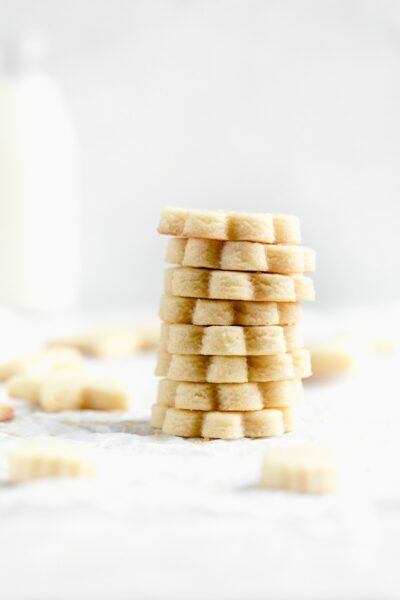 These look absolutely magical and would be such a sweet treat for Mother’s Day! 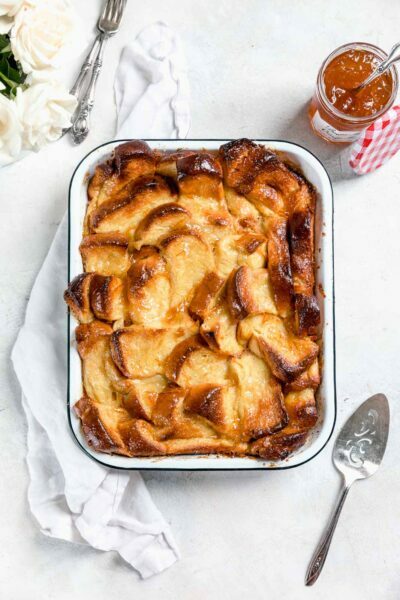 Such a delicious, decadent Mother’s Day treat! oh my gawd, I’m sending this recipe to my husband now! WOW! They look SO good! Such a sweet tribute to your mom and the most perfect brownies! What do you use, to make those nice straight cuts on your brownies? Dental floss? Mine always look scraggily – if that’s even a word. Thanks! They look amazing! Thank you! I use a sharp knife and clean it with hot water every time!